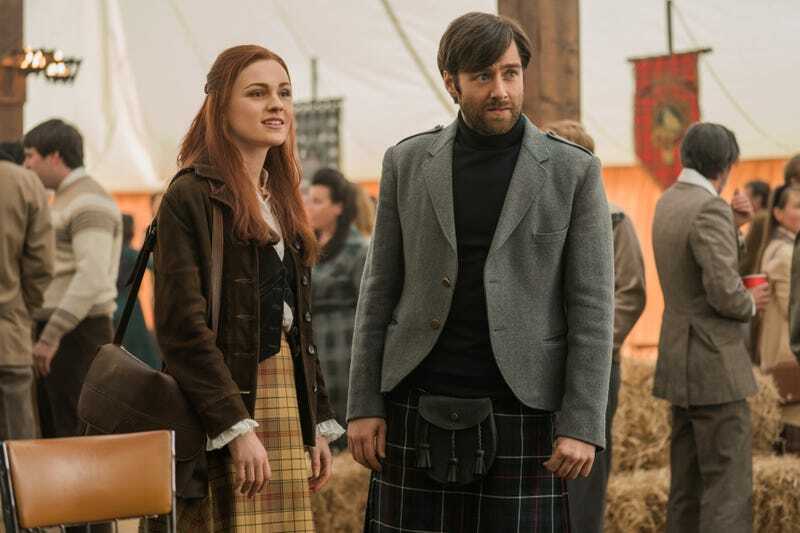 It might seem like it gets resolved quickly, Brianna and Roger coming back together the next day, but that feels believable, too. They’re both acknowledging that they let things get out of control. Though in her defense, Brianna was commendably honest and forthcoming with her own feelings, and it was Roger who let things spiral. They’re two very different people, and for now they want different things, but they don’t let that doom them, instead deciding to move forward, compromise, listen to each other. It’s touching, and it finally gives Brianna and Roger shades of all the wonderful character development and complex emotions that have been poured into Claire and Jamie by the writers through the seasons. Outlander really is a romance epic, and now it has two compelling couples at its center. Claire and Jamie, meanwhile, lose each other in the woods. Losing and then finding each other is basically their thing now, and Outlander gets a lot of mileage out of that push and pull. This time, Claire ends up thrown off her horse in the middle of the woods. When she comes to, she finds a human skull, and since she’s Claire, instead of becoming frightened, she examines it more closely. This leads to a vision of the man this skull once belonged to, reminiscing of the time Claire touched what ended up being Geillis’ bones and intuited how and where the person had died. There seems to exist some sort of link between time travelers, a ripple in the space-time continuum. Outlander never goes too deep into its sci-fi mythology, and it doesn’t really need to. That’s not really the point of the story. But these little glimpses are fun, reminding just how complex the show is genre-wise. It’s much more than just a love story. But the love story is undoubtedly the show’s greatest strength, its beating heart in a complex tangle of action, adventure, and fantasy. Before they’re separated, Claire and Jamie have an intense conversation about what he wants out of life, with Claire worrying that she in some way holds him back, a seed planted by Aunt Jocasta. Jamie admits that he lives his life differently when he’s with Claire, but that’s something that often comes with the territory of partnership. People change and bend for each other, and it isn’t necessarily a bad thing, but Claire is right to check in with him about it. Even though these two have been together through so much and for so long, they still have to negotiate with each other, check in on each other’s feelings, learn how to exist together. Those relationship things never really go away, and Outlander is starkly real in its portrayal of their romance, which never feels static. They’re so comfortable together, and the spark between them is still impressively lit, but that doesn’t mean there aren’t still obstacles. Jamie and Claire hit speed bumps all the time in their lives, as evidenced by the fact that they keep being separated by circumstance. But these emotional speed bumps are even more interesting than all the plot-driven ones. But the thing about Claire and Jamie is that they always find their way back, able to overcome just about anything. Only Claire would carry a human skull around in her purse like it’s no big deal. I really like the conversation between Jamie and Claire about Brianna and her close bond with Frank. With Frank out of the picture now, it’s easy to forget about the love triangle of it all, but it’s still interesting when it comes up. Jamie doesn’t seem jealous of Brianna’s closeness with Frank but rather grateful for his presence in her life when he couldn’t be there. The slow-motion dance scene is a little much, but I don’t hate it. Claire’s riding outfit is so good.